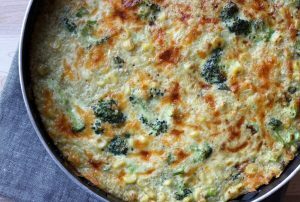 Using the basic fritatta ingredients you can add a variety of vegetables or seasonings. 1. Heat the oven. Arrange a rack in the middle of the oven and heat to 400°F. 2. Whisk the eggs and cream together. Whisk the eggs, heavy cream, and 1/2 teaspoon salt together in a small bowl. Set aside. 3. If adding bacon: Cook the bacon in a cast iron or oven safe fry pan. Add the bacon to the cold pan, then turn the heat to medium-high. Cook the bacon, stirring occasionally, until crisp, 8 to 10 minutes. Remove the bacon with a slotted spoon to a paper towel-lined plate and pour off all but 2 tablespoons of the fat. 4. Saute the potatoes in bacon fat, if not using bacon, sauté in oil. Return the pan to medium-heat, add the potatoes and sprinkle with the pepper and the remaining 1/2 teaspoon salt. Cook, stirring occasionally, for 4 to 6 minutes or until tender and lightly browned. 5. Briefly sauté the corn and broccoli with thyme to defrost. (Add the bacon back to the pan and stir to evenly distribute. 6. Add the cheese. Spread the vegetables into an even layer, flattening with a spatula. Sprinkle the cheese on top and let it just start to melt. 7. Pour the egg mixture into the skillet. Pour the egg mixture over the vegetables and cheese. Tilt the pan to make sure the eggs settle evenly over all the vegetables. Cook for a minute or two until you see the eggs at the edges of the pan beginning to set. 8. Bake the frittata. Put the pan in the oven and bake until the eggs are set, 8 to 10 minutes. To check, cut a small slit in the center of the frittata. If raw eggs run into the cut, bake for another few minutes; if the eggs are set, pull the frittata from the oven. For a browned, crispy top, run the frittata under the broiler for a minute or two at the end of cooking. 9. Cool and serve. Cool in the pan for 5 minutes, then slice into wedges and serve.